William Wordsworth’s wonderful daffodil poem is famously based on a location in the heart of the Lake District. But Melrose can lay claim to some Wordsworth fame too. The great poet visited the town in 1803 to spend time with his good friend, Sir Walter Scott. And secondly, Melrose pays homage to the humble yet beautiful daffodil each year as Spring dawns with a highway of daffodils showcasing where the old Waverley line used to be. The magnificent yellow trail leads from Melrose Station towards the new station at Tweedbank in aid of Marie Curie. As much as we love the highway of yellow each April, in the future it may replaced by the train making its way to Melrose Station and beyond to Hawick and Carlisle. For now though we are delighted that the railway has returned to the Scottish Borders with the opening of the new Borders Railway in 2015. It has been a huge success with over 1.3 million passengers using the line in its first year alone. The Borders Railway is the perfect excuse to take the train from Waverley Station (named after one of Sir Walter Scott’s famous novels) on the 55 minute journey to the end of the line at Tweedbank. Tweedbank is only a couple of miles away from Melrose. You can catch a bus from the station to Melrose, or we’re happy to arrange a taxi to take you there and back. However, when the weather allows, we would highly recommend walking and getting into the ‘Spring spirit’ to really enjoy the Borders countryside. Following signs for the River Tweed, the route takes you along the world-famous fishing river to Melrose arriving in the town at the Parish church which stands over the town and looks down to the Greenyards, home of Melrose Rugby. The Melrose Sevens take place this year on the 8th April. The Greenyards is open daily from 9am-2pm, where you can purchase a variety of Melrose and Sevens rugby souvenirs. From the Greenyards you can walk through the town to Melrose Abbey. The abbey was founded in 1136 and was the premier Cistercian monastery in Scotland. At its height it housed around 100 monks. Some Scottish kings are buried here, as is the heart of Robert the Bruce. The abbey is also home to some interesting carvings including that of a bagpipe-playing pig! Sir Walter Scott also has links to the abbey, supervising the extensive repair work that was to preserve the abbey ruins in the 1820’s. An historic site that is well worth a visit. After your trip to the abbey, enjoy a leisurely lunch here at the Burts or at our sister hotel, The Townhouse. Both hotels regularly change their menus with a focus on in-season local produce. Don’t take our word for it, below is a recent customer review. After lunch you can indulge in a little retail therapy with a wander around the shops in Melrose. Sadly, not many towns can still boast of having a butcher, a baker and a candlestick maker, but Melrose can. The town also has a deli, fishmonger, fruit and vegetable shop and Abbey Fine Wines with their eclectic range of wines, whiskies, craft beers and gins. You can read more about shopping locally in one of our earlier articles. Finally, a return walk to Tweedbank rail station can be taken via the old Melrose rail station which is situated just around the corner from the main town square. Melrose Station was opened in 1849. At the time it was an unusually large and opulent station for a town of only 1,500 people. But even then, Melrose was becoming a tourism destination and the station was intended to accommodate the needs of the tourists of the future. It is worth spending some time at the station imagining what it was like when steam trains arrived and departed on a regular basis and wonder if trains will return again one day in the future. 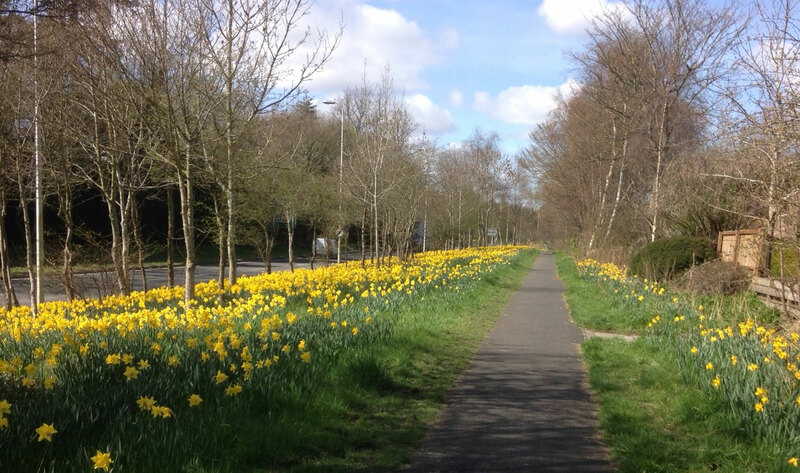 You can then walk the daffodil highway via the path back to the station at Tweedbank and your return trip to Edinburgh. Trains depart from Edinburgh and the Borders every half hour during the day. More information can be found on Scotrail’s website. Information on the local bus service can be found here. We can arrange for a taxi to pick you from the station just call us on 01896 822285 (Burts) or 01896 822645 (The Townhouse). If you’re planning on spending a few days with us, there are some wonderful walks around Melrose, this handy Melrose Walks brochure has walks for all abilities.